The C4 Corvette represented a clean break from the Zora Arkus-Duntov-designed C3, with a completely new chassis and sleeker, more modern but still evolutionary styling. It was the work of a team under chief Corvette designer Dave McLellan, who'd taken over from Duntov in 1975. In a departure from the fiberglass panels of its forebearers, the C4's rear bumpers and panels were made from molding plastics, a sheet molding compound. The C4 fastback coupe was the first general production Corvette to have a glass hatchback (the limited edition 1982 Collector Edition being the first Corvette equipped with this feature) for better storage access. The Corvette C4 came standard with an electronic dashboard with a digital liquid crystal display dash, with graphics for speed and RPM and digital displays for other important engine functions. Since emissions regulations were still changing and electronic engine management was in its infancy, horsepower was, compared to earlier generations, low. Therefore, the primary design emphasis, at least for the launch, was on handling and braking, with all-independent suspension with light-weight suspension and wheels, and all new brakes with aluminum calipers. The front suspension saw the C3's coil springs replaced by a transverse fiberglass mono-leaf spring, which was only 1/3 of the weight of the coil springs while also introducing an anti-roll bar-like effect on the front. The price of this no-holds-barred emphasis on handling was ride comfort, especially with the Z51 performance and handling package. The C4 did not use separate body-on-frame construction like its predecessors. Instead, it used what GM termed a "uniframe", which consisted of a traditional perimeter frame, with the door posts, windshield frame, halo,[clarification needed] and the rear portion of the floor pan integrated into one welded assembly. This was not a unibody assembly, as none of the exterior body panels were structural members. Due to a styling decision to use a targa top instead of T-tops, there was no structural member tying the windshield frame to the halo as on the C3. This required extremely tall side rails on the frame to maintain chassis rigidity, and as a result, the door sills were quite deep, with entry and exit likened by contemporary auto journals to a "fall in and climb out" experience. The targa top bolted into place, becoming a structural component, rather than simply latching on like T-tops. Despite the tall frame rails, the C4 was prone to rattles and squeaks, especially with the targa top removed. The emergency brake, located between the door sill and the drivers seat, was moved lower and toward the rear of the car in 1988 for easier entry and exit. 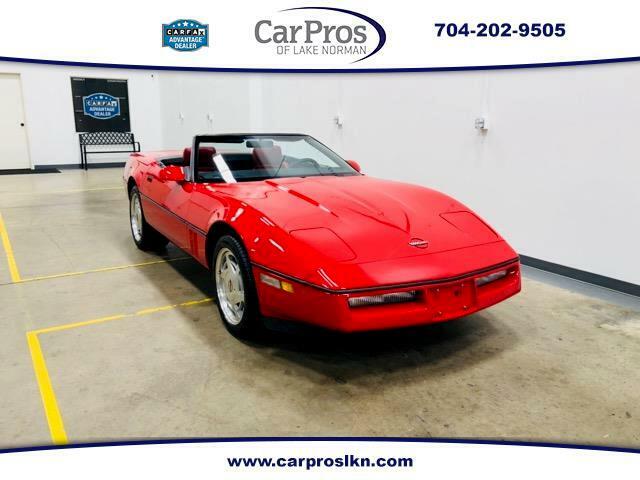 From 1984 through 1988, the Corvette was available with a Doug Nash "4+3" transmission - a 4-speed manual coupled to an automatic overdrive on the top three gears. This unusual transmission was a synergy that allowed Corvette to keep a stout 4 speed, but add an overdrive. As technology progressed, it was replaced by a modern ZF6-speed manual. However, the C4 performance was hampered by its L98 250 hp (186 kW) engine until 1992, when the second-generation Chevy small block, the 300 hp (224 kW) hp LT1, was introduced, markedly improving the C4's performance. 1996 was a high point of small block Chevrolet development and the 330 hp (246 kW) LT4 was introduced in all six-speed manual transmission cars. The LT4 produced maximum horsepower at 5,800 rpm and 340 lb-ft of torque at 4,500 rpm. While the LT4 was available in any Corvette, it was highlighted in the '96 Grand Sport package. The 1986 Corvette saw the reintroduction of the convertible and was named as the Pace Car for the Indianapolis 500. 1986 also saw the introduction of the Pass Key I passive anti-theft system, wherein each key contained a special pellet that could be detected and identified by the car's computer system by detecting electrical resistance. Being early in the rollout of this new technology, there were only 15 different resistance values available, which, once thieves discovered this weakness, markedly reduced the value of this early system.